Has walking become cool in 2018? Young adults may have a reputation for talking the talk, but according to a new survey, it now appears they’re walking the walk too. 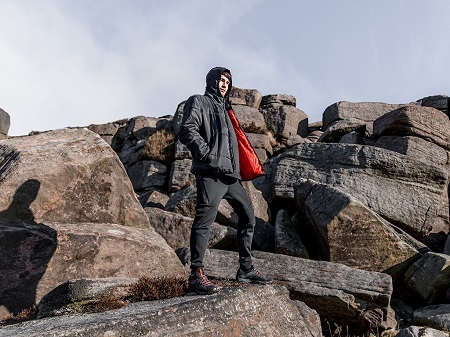 A YouGov poll of over 2,000 British adults, commissioned by leading outdoor footwear brand merrell.co.uk who were keen to investigate a spike in popularity across the UK for the humble hike, found that a staggering 49 per cent of 18 to 24 year olds are walking for leisure more frequently in 2018 than in previous years. The survey showed that 54 per cent of young adults lace up their walking boots for leisure at least once a week to get outside and enjoy the great outdoors. Move over Netflix and chill, over half of young adults surveyed (51 per cent) revealed they rambled to relax. Almost half of 18 to 24-year-old respondents (46 per cent) cited they walked to help improve their mental health, whilst 47 per cent said they took a hike to improve their fitness. Enjoying new experiences (15 per cent) and socialising (27 per cent) are also included in their rationale for rambling. Results showed a similar theme for the millennial demographic (22 to 36 years old), as 39 per cent said they walked for leisure more in 2018 than in previous years. Walking groups are on the rise and attracting younger members as an escape from the daily grind. Rebecca Chambers, 27, a member of Metropolitan Walkers, a London-based walking group for young adults said: “It is a great way to take a break from the busy city and switch off from work. The survey results are at odds with the long-held preconception that hiking is an old man’s game, as walking has fast become a fad exercise of 2018. Forget cagoules and walking poles, rambling has been injected with a dose of cool this year. The growing trend could be inspired by celebrities such as Gigi Hadid, Kendal Jenner and Taylor Swift snapping their walks in Instagram in the past 12 months. The results reveal a significant rise in walking participation amongst young adults as they take advantage of the many mental and physical benefits of walking whilst embracing the outdoors. The survey supports a recent study by University College London which found that the proportion of young adults who say they never drink alcohol rose from 18 per cent in 2005 to 29 per cent in 2015. The researchers said the drop in numbers of young adults drinking suggested a shift in attitudes towards alcohol. They say this could be due to increased awareness of the health risks of alcohol, as well as changes in the way young people spend their leisure time. Dr Andrew Murray, an ambassador with Merrell, NHS Inform, and researcher with the University of Edinburgh, said: “Regular physical activity is one of the best things you can do for your health. It adds years to life, improves physical and mental health, and even increases productivity. Hugh Sweeney, European Marketing Manager at Merrell, said: “The survey suggests there has been a cultural shift in young adults’ lifestyles. There appears to be a greater focus on physical and mental wellbeing and social experiences – walking ticks all the boxes.